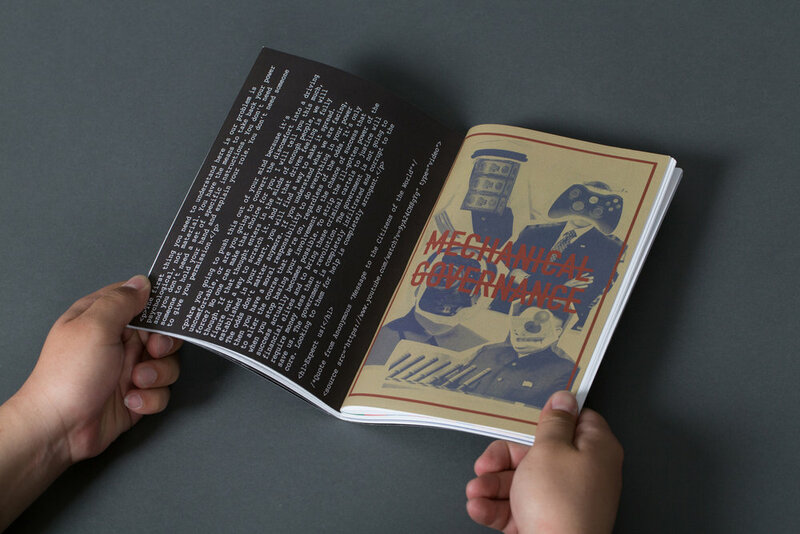 Cyber Governance: Communication Design and Authoritarian Power in Cyberspace is my graduate thesis, completed for Pratt Institute’s MFA Communication Design Program in May 2016. This thesis is about technological politics. It aims to study what direction of social structure does the exercise of power within cyberspace lead us toward, and reveal how communication design, especially interaction design and interface design became the tool to establish authoritarianism in digital media. Communication design in this medium creates the concept of “user experience”, which establishes a convenient lifestyle that incorporates corporeal behaviors and digital automations into a constant connected wireless network. However, the foundation of these pleasant experiences is the exchange of data, which translate from every aspect of physical conditions in our behavioral patterns, such as locations, biological features, gestures, brightness, time, movements, etc. Once these factors have been translated into data, it became documentable and transmissible. The distinction between physical and digital is ambiguous that dominance power agents are able to manipulate the form of interfaces to entice users embrace these technologies and contribute more data. This process is definitely the exercise of authoritarian power. 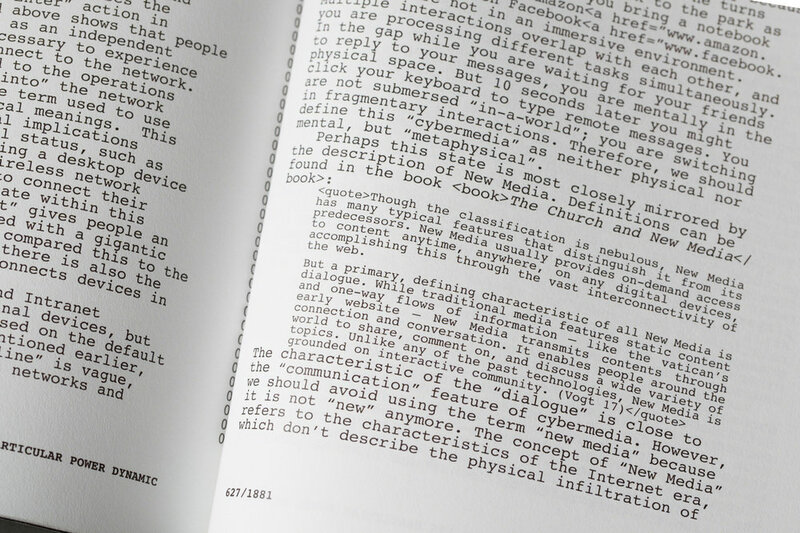 The design of this publication embodies the characteristic of “cyber” that distinguish from other communication medium: ambiguous and ubiquitous. 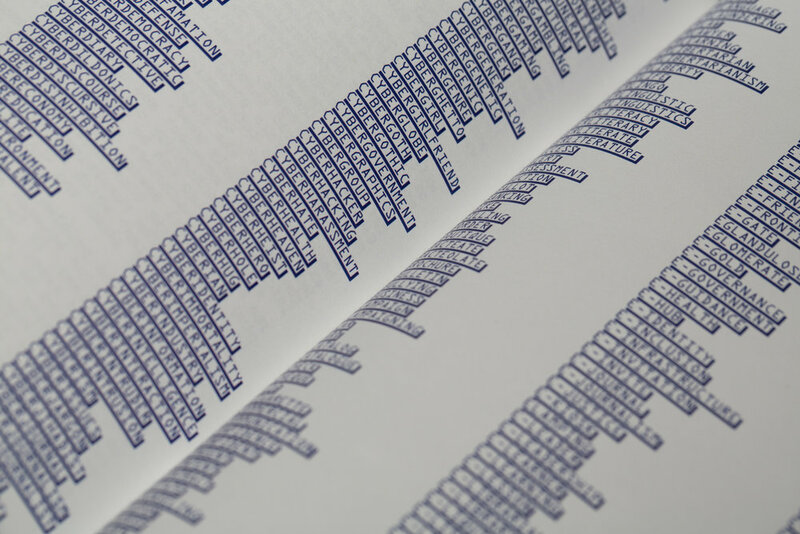 The typographical design reveals the essential of this technology: massive metadata and documentations. Monotype has been used in typewriters, which can be found in official documents in authoritarian institutions. However, it also been used in coding environments. 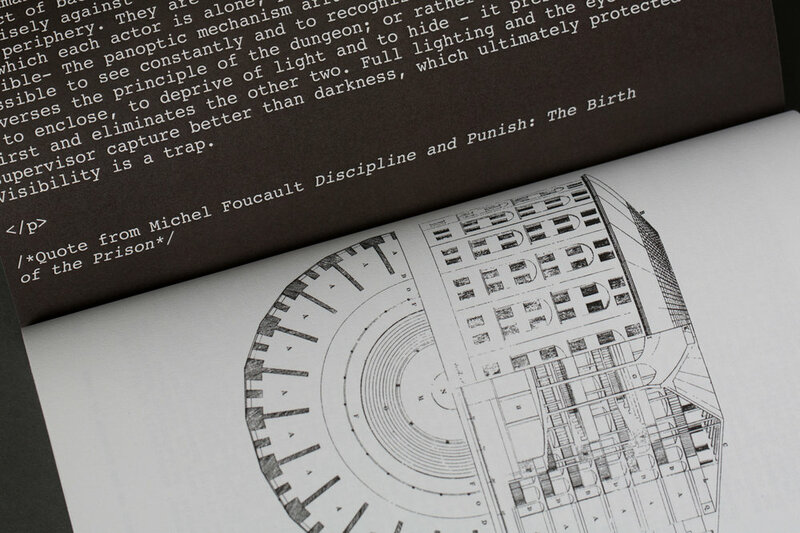 Therefore, by referencing the visual elements of official documents and programming environments, the design of these book reference a “raw” archive, play with the ambiguity between physical and digital conditions, which let audience reconsider the data translation and documentation behind these technology. This publication included my thesis paper and all related design projects, an interview by Tim Jordan who propose the concept of “cyberpower”; two essays relate to the topic, “A Declaration of Independence in Cyberspace” by John Perry Barlow and “The Californian Ideology” by Richard Barbrook and Andy Cameron, and the transcript of the video “A Message to the Citizens of the World” produce by hacktivist group Anonymous.